Hotel Khadim in Ajmer is named after the famous Sufi saint Khwaja Moinuddin Chisti's devotees. Hotel Khadim is the preferred stay for the travelers and parents of Mayo College students. Most of the city's market is located not very far from the hotel. Hotel Khadim is ideal place for making over night stay, if coming from Delhi and going to Jodhpur/Udaipur/Mount Abu. Spacious Air condition restaurant offers variety of vegetarian and non vegetarian dishes including Rajasthani savour. Air condition Bar serves variety of drinks including Scotch, wine and beer. Hotel Khadim provide traveler an experience of Rajasthan with safety and security. 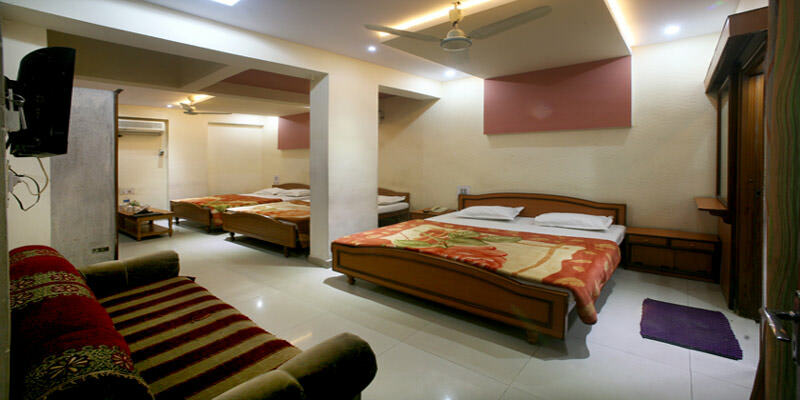 Hotel Khadim has well furnished rooms for comfortable accommodation. There are 1 suite, 42 AC rooms and 14 Non-AC rooms which are well decor and spacious. Facilities: Conference Room, Lush Green Garden, Doctor on Call, Laundry & Dry-Cleaning, Credit Cards Acceptance, Parking Facility. Dining in Hotel Khadim: Khadim hotel has a restaurant which offers Rajasthani, Indian and Continental cuisine. Its bar are well stocked and serves Indian, Rajasthani liquor ,wine and beer. Hotel Khadim is located at a distance of 150 km from the airport, 2 km from the railway station and 1 km from the bus stand in Ajmer.Ajmer is must visit place with Pushkar lake and Ajmer Sharif Dargah are its major attracton. Urs of Khwaja Moinuddin Chisti and Pushkar Camel fair are major fairs in Ajmer.